1. It is worthy of wonder, how Judas betrayed his Master, even though he saw Him do many great miracles? Judas initially must have been good. Like the other disciples of Christ, he left family and work for the Messiah. Surely he must have endured hardships on his journeys during the three year public ministry of Christ. Christ would send His disciples on missions to towns and villages to prepare the people. The disciples then, together with Judas, preached that the Messiah came, and they would confirm their words with miracles (Matt. 10:1-8). Judas was particularly honored by Christ to hold the common funds. From this he would shop and give money philanthropically to the poor (Jn. 13:29). 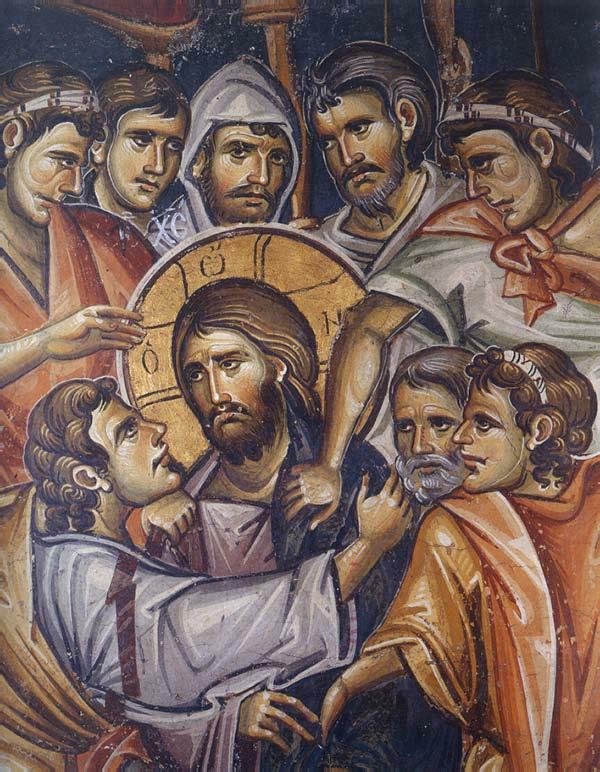 When Christ began from Galilee to Judea to be sacrificed, Judas followed Him, listening to the words of his fellow disciple Thomas: "Let us go and die with Him" (Jn. 11:16). John the Evangelist writes that Judas had a certain passion for avarice (12:6). It seems he was committed to this passion, and driven to infidelity against Christ. Avarice opened his soul to Satan, giving rights to the evil one. Luke the Evangelist (22:3) writes that before Judas consulted with the chief priests for the betrayal, Satan entered him. This is confirmed by John the Evangelist (13:2), saying that Satan put betrayal into the heart of Judas. The same Evangelist says that at the end of the Mystical Supper Satan again entered Judas (13:27). Let us see: in Bethany Christ's feet were anointed by a woman with very costly myrrh. Judas with other disciples resentfully complained (Matt. 26:8 and Jn. 12:4-6). This protest is a sign that they questioned the infallibility of Christ: how did He allow this? When Christ stepped in and asked not to embitter the woman for her manifestation of love, for she prepared His body for burial, the others humbly hushed, but Judas was annoyed, and influenced by Satan he left to betray Him. Selfishness blinded him. Surely Judas did not believe in the divinity of Christ. A God deserves all honor and sacrifice, not betrayal. He wanted to be a teacher to Christ. Indeed he hid his avarice under the cover of being interested in the poor. Sinners usually try to cover their sins and justify them. Through the mediation of Judas the chief priests rejoiced (Mk. 14:11 and Lk. 22:5), because now they could arrest Christ away from the mob at night, while everyone slept. Judas even openly assured them and gave them a promise that Christ will be delivered without the presence of a mob (Lk. 22:6). The cause of the betrayal was not so much greed as it was about ego. If he was only a miser, he would have left his poor teacher Christ earlier. Although he eventually received money, yet he did not abandon Christ. Now he abandoned Him, because his ego elevated. If he did not have a big ego, he would have continued stealing and not betrayed his Master. Certainly he had avarice, because he took the money to betray Christ. Perhaps Judas, when he lost his faith in the divine origin of Christ, started to explain away the miracles of Christ, like the Pharisees, as demonic energies. Egoism darkens man, so that he cannot discern what is right. Judas was blinded by avarice, egoism and the devil and did not know where he was going. 2. Was the betrayal of Judas inevitable and had to be done? That a disciple would become a traitor, God foreknew. Besides that, David also prophesied it in the Old Testament (Ps. 40:10 (41:9)). Christ prophesied it many times. Christ foreknew it, but did not predetermine it. He prophesied it because He knew it would happen. God saw the betrayal and foretold it. The foreknowledge of God is not to blame, but the freedom of Judas. When after the multiplication of the five loaves and two fish, long before His Passion, Jesus spoke of Holy Communion, His body and blood, and some disciples told Him, "this is a hard saying" and left Him. Christ then told the twelve: "Do you also want to leave?" Peter responded: "Where will we go, You speak words of eternal life and we believed and have seen that You are the Christ, the Son of the Living God." Jesus responded: "I did not choose the twelve of you, and yet one of you is a devil." Here he was speaking of Judas (Jn. 6:60-71). Here Christ says something paradoxical: "If I chose you, among you is a traitor." The sacrifice of Christ on the Cross was more painful, having been betrayed by His disciple. This betrayal teaches us that all of us who are near to Christ are in danger of betrayal. Judas is a model of many future traitors. If the disciple of Christ who saw the great miracles of Christ betrayed Him, how much more danger are we in who have not beheld Christ and His miracles? Christ would have been arrested and sacrificed without the mediation of Judas. It is not possible for the All-Good God to use a person for His plan and lead him to eternal damnation. If Judas did pious work, He would not have allowed him to commit suicide. Judas shows the great corruption of people and the need for the divine sacrifice. 3. Why did Christ allow His disciple Judas to betray Him? Christ many times tried to dissuade him from betrayal. Long before His Passion, Jesus repeatedly (Matt. 12:40; 16:21-28; 17:12; 17:22-23; 20:17-19) prepared His disciples for the Passion. He told them that He would suffer much, would be rejected by the religious leaders, would be killed, and on the third day would rise again. In one foretelling of His Passion (Matt. 16:21-28), Peter responded and asked that His Passion not take place. Jesus answered Peter: "Get thee behind me Satan,... you do not follow the will of God, but think as men think." He then asked His disciples if they would deny Him and said: "What will it profit a man if he gains the whole world, and loses his own soul." These words were a hard warning to Judas who lost his soul for thirty pieces of silver. At the Mystical Supper, after the washing of His disciples feet, Christ said: "You are clean, but not all of you" (Jn. 13:10-11). He knew the one who would betray Him. Then, though He was teaching about humility (which is why He washed the disciples feet), He warns Judas again by saying the prophecy of David (Ps. 40:10): "Yea, mine own familiar friend, in whom I trusted, which did eat of my bread, hath lifted up his heel against me." Judas' hypocritical anxiety was shaken due to the loss of his soul by Him clearly stating that someone would betray Him (Jn. 13:21). Judas again did something ignorantly. Christ refers to him implicitly by saying: "The one who has dipped his hand into the bowl with Me will betray Me" (Matt. 26:23). And though Judas continued to hide himself, Christ says in a menacing way: "Woe to the man through whom the Son of Man (the Messiah) will be delivered. It would have been good for him had he not been born" (Matt. 26:24). And while everyone was saying, "Is it me? ", Judas, in order not to show himself by his silence, also asked Jesus without shame, "Is it me?" Christ told him: "You have said it", that is, it is as you say. His bosom disciple says that Christ at Gethsemane knocked Judas and the soldiers backwards when they approached (Jn. 18:5-6). Judas was not moved, but hypocritically greeted Christ, saying "Hail Rabbi!" and kissed Him heartily (Matt. 26:49). Christ did not speak evil of him, but said to him: "Friend, for that which you came to do, do quickly" (Matt. 26:50). Luke (22:48) completes the words of Christ with a question: "You betray the Son of Man with a kiss?" It's as if He said to him: I know why you came, you are a traitor; your warm kiss does not fool me." Christ tried to warn him. Judas, however, was adamant in his treason. 4. Perhaps Judas betrayed Christ because He was not the liberator from the Romans? Christ never spoke of a revolution with weapons. His warnings of His Passion never included talks of a possible revolution. If Judas was a zealot, or a revolutionary, he should have waited lest Christ show later His divine power and liberate the people. With his betrayal he led Christ into obscurity. With the death of Christ he gained nothing for the cause of a revolution. If Christ disillusioned Judas, he should have abandoned Him and waited for another liberator Messiah. Also a revolutionary Judas does not justify being a traitor and hanging himself. When he returned the money, he told the priests: "I handed over innocent blood" (Matt. 27:4). The revolutionary Judas would have had to keep the money for the needs of the expected revolution. His hanging did not change the status of Roman rule. All the people were waiting for a liberator Messiah. When Christ multiplied the five loaves and the two fish and thousands of people ate, those who ate said: "This really is the expected prophet. Jesus realized they intended to make Him king, so He departed the mountain by Himself" (Jn. 16:14-15). And the disciples of Christ were awaiting liberation from the Messiah. In fact two of His closest, the brothers James and John together with their mother, asked Christ that when He was soon to be the king in Jerusalem, if He would put them to the left and right of His throne. Christ explained to them that the bitter cup of His Passion awaited Him in Jerusalem (Matt. 20:20-23). They, however, did not betray their teacher. Judas was not a revolutionary, but fainthearted, selfish and avaricious. 5. Didn't Judas repent when he returned the thirty pieces of silver to the chief priests and told them that he sinned by handing to them innocent blood? Real repentance is one thing, simple remorse is another. True repentance is characterized by the attempt to correct the evil, while simple remorse is a change of mind (a shifting) without any attempt to correct the evil. Judas acknowledged his mistake, but he didn't do anything to correct it. If he truly repented, he would have went to find Christ and with tears asked for forgiveness, like Peter. That he committed suicide shows that his ego now operated towards self-destruction. Obviously also the devil had influence and led him to despair. If Judas truly repented, he would have been saved.